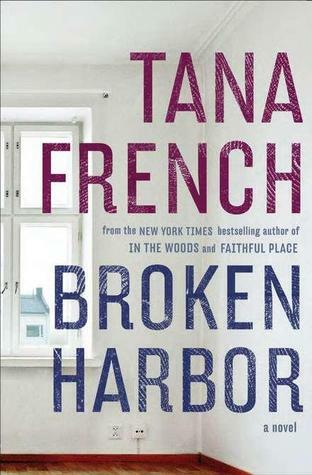 Probably by now readers have heard of Tana French, who writes crime mysteries based in Ireland. She has a couple of psychological dramas out there already, like In the Woods and The Likeness. This novel, it seemed to me, exceeds her previous books. She has given us several crimes this time, revolving around a triple murder. There is lots of crazy…crazy that seeps up around everyone’s ankles and slowly, slowly comes up around their noses, threatening to drown the whole lot…detectives and suspects alike. I listened to this on audio, published by Recorded Books, read by Stephen Hogan. The novel is in the voice of “Scorcher” Kennedy, who gets this major case after a long period working on smaller things. At the beginning he sounds ready, but when his family situation and the case converge and threaten to sink him, he reaches out to save himself. 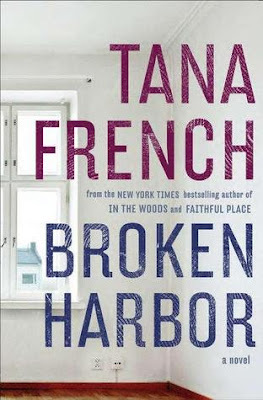 Broken Harbor has been renamed “Brianstown” when, before the financial downturn, a large new housing development is created out on a strip of land so remote that people feel unmoored, even before the crash forced the builder to pull out. The few sold houses sit amid a ghost community, with unfinished foundations, rusting heavy equipment, and empty, unsold homes. The chilling truth is that this is the largest crime, the theft of lives long before a knife leaves them bloody on the kitchen floor. This is not a book to read when one is in a hurry. If you have a stack of things to “get through” and want to check this off the list, I urge you to put it aside until you have time to savor the language, and remember the languorous time of childhood when small realities intrude upon days of fantasy and play. The time is Argentina in the 1970’s, when political disappearances are common. A new government has taken over from the Peron government and suddenly opponents of the new government find themselves unemployed, ostracized, pursued. A family senses danger closing in and escapes to a borrowed quintas, or summer house, outside of Buenos Aires to wait out the repression. But time is not on their side. The language is simple and beautiful, and the story is told in the voice a young boy who only occasionally glimpses the real world around him. The buildup of tension is almost imperceptible. The parents tried to act normal, and the boys, aged 5 and 10, felt but did not understand the undertow of tension and uncertainty. This would be an excellent book for young adult readers, for much of the book is seen through the eyes of a child, and is immediately accessible to teens. The descriptions of the countryside and of the actions of the parents ring true and yet there is always some bigger mystery hidden in each of the short chapters. It would be an excellent addition to a history lesson on South America or Argentina. Some may know of the book from the 2002 movie of the same title. For years I’d wanted to have a go at reading this, and when Grenville was again nominated for an Australian Prime Minister’s Award for Sarah Thornhill, the third book in the trilogy of which The Secret River is the first, I finally decided to begin at the beginning. This novel was a finalist for the Man Booker Prize in 2006, and won numerous other awards when it came out, for good reason. It is old-time storytelling, whose characters who begin life poor and grubby on the streets of London early in the nineteenth century, get “sent down” to Australia in a convict ship, earn their freedom, and scratch out an existence in that unholy land. Grenville’s descriptions give us the crammed, cold, crooked, cobbled streets of London grimy with cold dust. She contrasts this with the dry heat of Australia, blazing with sun, and the wide open, unsettled (and unsettling) bigness of it. The Australian Aborigine is caught to perfection in her words…the thinness, the looseness of limbs, the blackness, the brows, the teeth, the joy, the dignity and fierceness. Her language is Dickensian, her story that of Australia. Parts of this book are difficult to read, they seem so cruel. That man is a fearful and fearsome creature, we know. It is just painful to see ourselves through that glass so darkly reflected. I can hardly recommend this title enough. I have loved the writing of Kate Grenville forever, it seems. She has the potential for greatness, and while some of her books may not quite reach that level, this one does. I listened to this book on Blackstone Audio, narrated by the excellent Simon Vance. For those who come away from this book with that breathless sense of needing to know how she did that, she has written a memoir about writing the novel called Searching For The Secret River: A Writing Memoir. I believe it took her as long to come down from writing it as it will take us to absorb it. I look forward to enjoying her skills again. This very long, very dark, and highly imaginative work by Adam Johnson forces upon the reader a series of distasteful sensations, only a few of which are horror, fury, hatred, injustice, and revenge. But by the end, one also experiences hope, compassion, sincerity, integrity, and love. Thoughts surface, submerge, roil in the mind during the days spent reading this huge novel, leaving one as drained and unsettled after a session with it as if one had “eaten bitterness.” Welcome to North Korea. If you’ve ever wondered, this is one man’s take. Much has been written of Johnson’s seven years constructing this story. He had done research, and in several interviews pointed to memoirs of escapees, like The Aquariums of Pyongyang, and one recently published by Penguin, called Escape from Camp 14. Johnson undoubtedly used news reports to reimagine the visits of western envoys as part of his story, but the blackness central to the society was difficult for me to believe. However, in one interview published in the Paris Review, Johnson denies he showed us the real blackness: “…I had to leave much of the darkness out of my book. The real darkness of the gulag there was so bleak that I had to cut it out. You couldn’t read it.” It is just as well, then, for this book was quite black enough to leave one feeling untethered. The novel is broken into two parts. The first half tells of a young man growing up and finding his way in a society that seems confusing and dangerous: innocuous behaviors have consequences that are out of proportion to their intent. It is difficult to read this half of the novel. I am not enamored of character-as-victim when the consequences are so dire. Relief comes immediately in the second half of the book, when we perceive a shift in the balance of power, from state authority to the citizenry. The young man of Part I, Jun Do (perhaps “John Doe”), decides to he will write his own obituary and becomes an actor rather than merely acted upon. We are told of this change in the power ratio in an ingenious series of flashbacks as he is being interrogated over a period of time. The interrogator is the voice in this section of the novel, and we see the power of Jun Do’s non-confession on his listeners. I think, perhaps, only an American could have written this book. A novel of the same subject written by a European may be more philosophical, literary, and well…sad. This is literature, but it is brash, brazen, curious, and a little like America’s pop culture: the hero molds his own story and puts it right out there for everyone’s delectation. He doesn’t lie, but he spins the truth, and keeps on spinning to the end. The story is also a remake of that American classic film, Casablanca, in which the hero with a great love for a dame allows her to escape to freedom while he deals with the demons that would hold her captive. I am not going to deny the first part of this book was difficult and agonizing for me to read, but I urge readers not to forsake the book before you reach the middle if you are at all interested in the subject. In Part Two we finally see a man rather than a victim and the character of the book changes completely after this break. It is fiction in the form of a prison diary. If you’ve ever read Aleksandr Solzhenitsyn’s Gulag Archipelago 1918-1956, or Elie Wiesel’s Night, you will remember how riveting books of desperation and depravation can be. And yes, I did order Escape from Camp 14 to read after this. I want to see how much parallels what Johnson created, and because one’s palate for ordinary fiction is rather spoiled after such a book as this. Sometimes great literature demands more of us. While I am not ready to place this in the “greats” file yet, it is big, brave, unblinking. Johnson has a unique voice that cannot be mistaken for another. He brings to us news of the condition of people in North Korea, an issue we need to examine. An interview of Adam Johnson by Charlie Rose about this book can be viewed here. 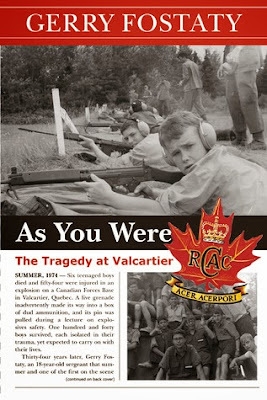 The strange and haunting story of the tragedy at the summer cadet camp in Valcartier, Quebec continues to plague the families whose men and boys were involved, 38 years after the events there took place. Imagine the indolence of deep Canadian summer in 1974, when 13- to 15-year-old boys gather at cadet camp to learn to discipline, obedience, and the manly arts. On a routine rainy day, while the boys are learning the dangers of unexploded ordnance by viewing dummy ammunition in a barrack, a live grenade detonated, killing or injuring 60. A mistake, a carelessness compounded again and again over a period of days, led the live grenade to be placed in a box of dummies. The instructor was not responsible for the disaster and indeed was himself injured in the explosion. A series of unfulfilled transfers from a live demonstration led a box of live ammunition and a box of dummies to be placed side-by-side in the back of the same truck. The lives of hundreds of people were directly or indirectly altered by events that day, and one cannot help but look with scalded eye at the army handling of the moment and the aftermath. The leadership of armies the world over are slowly becoming aware that their ranks are people, too, who can be as great or as lax as the organization that feeds them. But they can also be injured deeply in psychological ways that do not appear to be wounds. While the Canadian Army is not perceptibly different from any other national service, they did their staff, cadets, and their families a disservice that summer of 1974 by ignoring if not suppressing news of that event. They can do better. The Army leadership could start by making Fostaty’s recounting of the story required reading. It would be an excellent teaching tool for Army staff and a kernel for discussion. The errors of that day, whether of action, of inaction, or of judgment, do not need to be compounded now by ignoring attempts to come to terms with the event’s effects. Fostaty reconstructs events of that fateful summer in narrative form, using the army’s own investigation results and recounts in dispassionate tones recurrent nightmares over a period of nearly forty years. He was a good soldier then--good enough to teach cadets--and he is a good soldier now. He raises valid points that the Army organization might heed. Errors of this magnitude can be only tragedies if they are ignored or repeated, but if they improve performance or change poor management, they can also be stepping stones to betterment. It is time now to look hard at events that summer, to celebrate the lives of staff and cadets killed or injured on duty in peacetime, and to move forward as better soldiers, in a better organization.